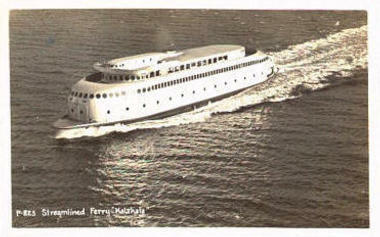 The motor ferry "Kalakala" has come home! 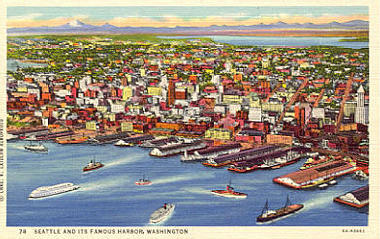 Hundreds of Seattleites swarmed Bell Street's Pier 66 on November 6, 1998, to welcome home the "queen" of Puget Sound, towed by the tug "Neptune" in a two-week voyage from Kodiak, Alaska. 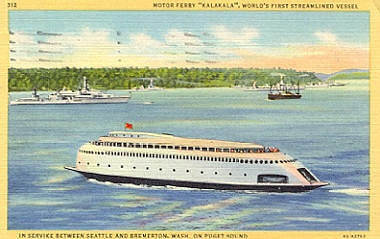 The effort by Peter Bevis and his volunteer crew to return the "Kalalaka" to Elliott Bay is a success...and now the work begins. 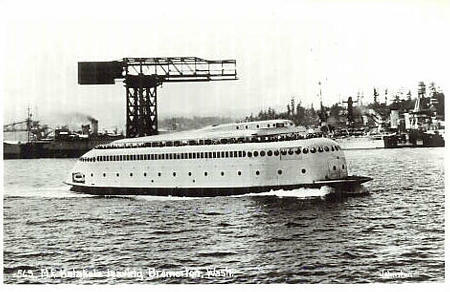 In mid-March, the "Lady K" was moved through the locks to Lake Union, where she is protected from harsh salt spray and the wakes of passing freighters and ferries. 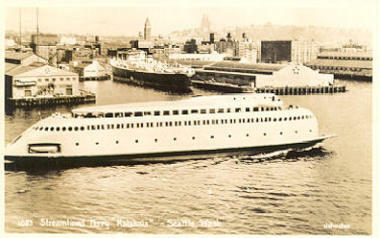 Plans are to create a floating museum on the waterfront near Pioneer Square. 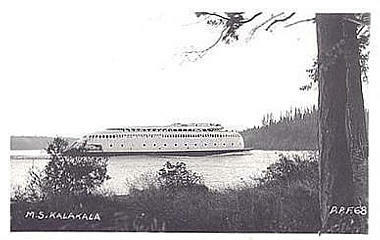 If you love the "Kalakala" and would like to contribute to the cost of restoring and preserving this beautiful Art Deco sysmbol of Seattle's maritime history, please contact The Kalakala Alliance Foundation. 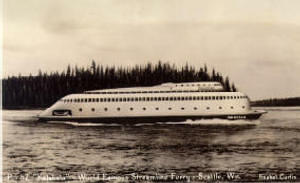 Retired in 1967 after more than 30 years' service on Puget Sound, the one-of-a-kind streamlined ferry was moved to Alaska as a cannery, but has been rusting away for over 25 years. 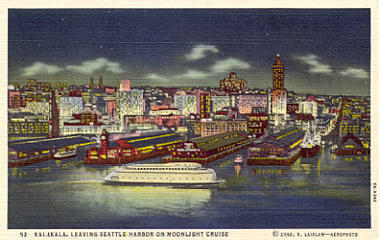 Thank you, Peter, for bringing her home! 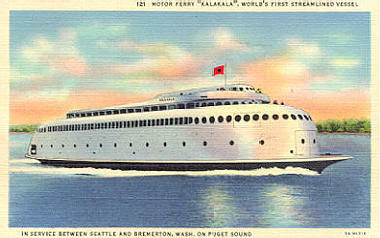 Here, we've collected some postcards of the "Kalakala" for you to enjoy. 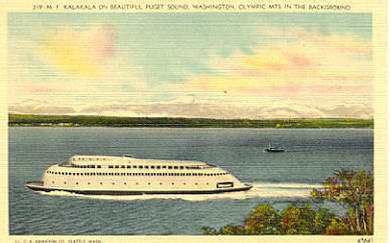 PC-637 Asahel Curtis photo of "Kalakala"
"Kalakala" leaving Bremerton -- a rare view! 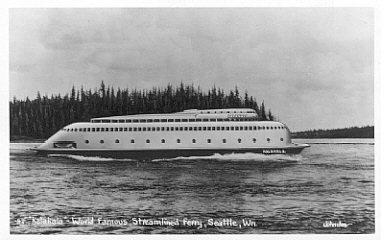 More about my favorite ferry . . .